Shoppers stopping by the Woodstock Safeway store to pick up groceries for the weekend said they were surprised by a commotion in the Wells Fargo Bank branch inside the store late Friday afternoon, June 23. "It looked like security guards in the area, but I guess they were actually police officers," a shopper told THE BEE on her way out of the store. In fact, the 9-1-1 Center reported a robbery taking place there at 5:37 p.m. that afternoon. Other witnesses said a man – with a full gray beard, large white hat, light shirt, and blue jeans; about 6' tall, and 200 pounds – looked to have a semiautomatic pistol tucked in his waistband which he showed the tellers during the robbery. The suspect left the store with money stuffed in a white plastic shopping bag, and was last seen heading up Woodstock Boulevard. 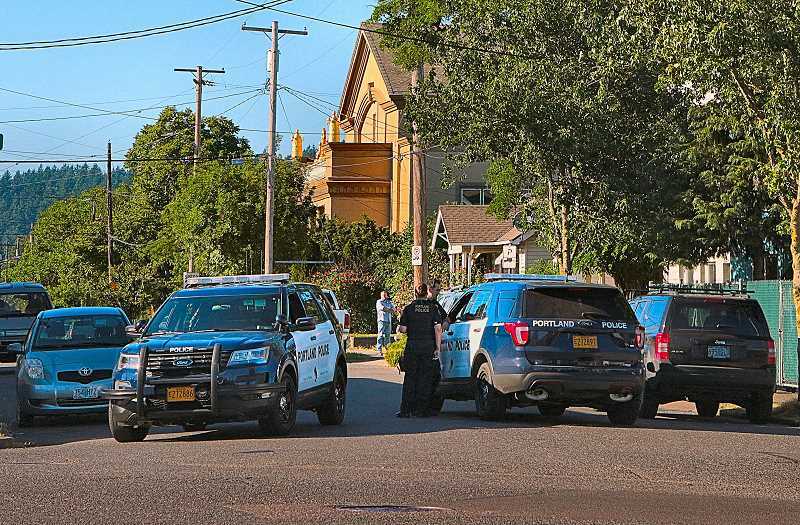 In minutes, a dozen Portland Police Bureau units were crisscrossing the neighborhood, in ever-widening circles – including the bureau's "eye in the sky" air unit. Officers tracked the robber to near the intersection of S.E. 62nd and Foster Road. Since Portland Police and F.B.I. agents were still actively working the case, and THE BEE was being assembled for printing at the same time, no further information was available to us before going to press. We hope they got the guy.